Dr. Scholl’s Fungal Nail Revitalizer System improves the appearance of nails disfigured by fungal infections in as little as one week. It uses a “3X” Triple Action System. It also lightens dark and discolored nails, smooths thick and rough nails, and moisturizes dry and brittle nails. It includes a buffer brush to smooth thick rough nails and scrub away dark buildup, as well as a revitalizer cream to moisturize dry nails. Dr. Scholl’s Fungal Nail Revitalizer System comes in a blue and yellow box with the bold label. I looked into the product to see what information I could find about the effectiveness, price and guarantee. Unfortunately we are not given any specific information on what each ingredient does, which could be a little worrying for some consumers. The website says that users should apply enough cream to spread over the entire surface of an infected nail, then scrub for at least one minute with the buffer brush. They should then wash and dry the nail completely. The website also states that for best results they should use it daily for 3 weeks. It does say that it is not a cure for fungal nail, as only prescription medicine can cure it; it is merely a revitalizer for a nail affected by a fungus. I was not able to buy Dr. Scholl’s Fungal Nail Revitalizer System directly on the website but was given a choice of two other websites to complete the purchase on. I chose the Walmart website where a package retails for just $8.94 – a very inexpensive price. Yes! The website states it has a money back guarantee. Certainly reassuring for buyers. There were also two user reviews on the website; of which, both gave Dr. Scholl’s Fungal Nail Revitalizer System 5/5 stars and were complimentary. I was also able to find the product on Amazon.com where it had 12 reviews and an overall rating of 3.5 stars out of 5. 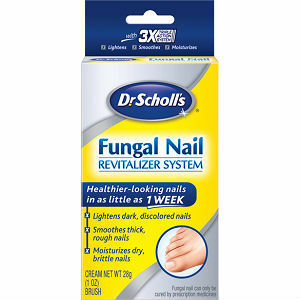 Dr. Scholl’s Fungal Nail Revitalizer System is an inexpensive product which works in a quick timeframe. It has good reviews on the website as well as at Amazon.com. However, this product states several times that it is not a cure for fungal infections but is merely a product which improves the look of an infected nail. Jack Stevens	reviewed Fungal Nail Revitalizer System	on June 12th	 and gave it a rating of 2.5.